The TSD 2018 conference will take place in the city of Brno and the local organiser is the Faculty of Informatics, Masaryk University, Brno, Czech Republic. The conference will be held in the conference halls of Hotel Continental. The Conference place is displayed on the map of the city displaying both the Faculty of Informatics and the conference venue. During the conference there will be the reception desk available at the conference lounge. Near the reception there will be technicians prepared to help the presenters with the computer equipment. The technicians will be available during the whole conference program. Accommodation is not directly organized by the conference OC, however, TSD 2018 participants and accompanying persons can avail of special accommodation conditions in the conference hotel Continental. Detailed information about accommodation can be found at the Registration page. All kinds of other accommodation facilities can be found e.g. via booking.com. You can easily find a suitable restaurant at the web page of zomato.com. The hotel Continental is located in the city quarter Brno-stred (Brno centre). If you arrive before the start of the conference, go directly to your accommodation place. If you arrive late at night, there is a nonstop service at the accommodation place. The Hotel Continental is very near to the city center (about 300m), so just follow the road signs to Centrum. You can find your way to the hotel Continental on the Google map of the conference location. Parking in the hotel garage is available for hotel guests for extra charge of CZK 250 per day. Brno taxi services have better reputation than those in Prague. Overcharging does not happen so often and the taxi-gang wars are not an issue here. In any case, when using the taxi, ask about an approximate price in advance and make sure that the taxi-meter has been set to zero at the beginning of the ride. An operator of City Taxi (phone number +420-542 321 321) is able to speak English. Prices for travelling from bus or railway station to the conference and accommodation sites should be roughly CZK 200-300, from Brno Airport CZK 500-600. The Brno main railway station is called "Brno Hlavni nadrazi". To reach the conference site (Hotel Continental, Kounicova 6) use the tram line 1 in direction "Reckovice" and leave on the second stop "Moravske namesti". From Moravske namesti walk for about 200m to the Hotel Continental. Important points can be found on the map of conference location. You have to buy a standard tram ticket (CZK 25) in any news-stand before you enter the tram and mark it inside the tram. For the Hotel Continental, which is only two stops to Moravske namesti, a 15 minutes tram ticket is sufficient (CZK 20). There are two big bus stations in Brno: "Grand hotel" and "Zvonarka". The first one is located near the railway station. The second one is located about 500 meters from the railway station (over footbridge to Vankovka shopping centre and TESCO store, then through underpass to railway station). You can use bus lines E76 or N89 (night bus) to reach the railway station from the airport. The currency used in the Czech Republic is the Czech Crown (ceska koruna, CZK or Kc). There are exchange facilities at the train/bus stations, airport and at the border. The approximate exchange rate is 20 CZK for one US dollar and 25 CZK for 1 EURO. See actual exchange rates. Czech Crowns are available in the following denominations: 100, 200, 500, 1000, 2000 and 5000 banknotes (see the list of Czech banknotes). We advise you to ask for at most 1000 crown banknotes when you exchange your money as these are easier to change. Do not change money on the street. Brno is the second largest city in the Czech Republic, with a population of almost 400.000, and is the country's judiciary and trade-fair centre. The first written record of Brno dates from the ninth century. City rights were acquired in 1243. After successfully defending the city against the Swedes 350 years ago (in 1643--45 during the Thirty Years' War), Brno became the capital of Moravia. The nineteenth century was a period of technological progress and development for Brno. It became one of the most prominent industrial centres in the Austro-Hungarian Empire. It was in Brno that J. G. Mendel formulated his theory of heredity, V. Kaplan produced the first water turbine and Leos Janacek composed his musical works. Milan Kundera wrote his first novels here. Brno is the place of birth of Kurt Goedel -- a major 20th century scientist of international standing. 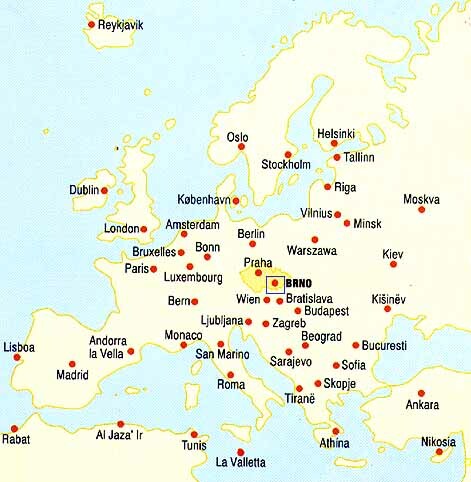 The Czech Republic consists of Bohemia in the west and Moravia in the east, with Brno the capital of the latter. It had been a royal city since 1347. There are six Universities in Brno. The "Bishops' Church of St Peter & St Paul"
Many other important examples of Czech architecture between the wars (1918-38). The Czech Republic is on Central European Summer Time (CET DST, CEST), two hours ahead of Greenwich Mean Time (GMT+2) during the Daylight Saving Time period. The average temperature for September is between 15-20 degrees celsius. The weather is normally warm and sunny.